Used indualor single clutch applications where a diaphragm spring is incorporated into the assembly. The operating face of the bearing provides a fulcrum point designed to operate against theflat part of the diaphragm fingers. 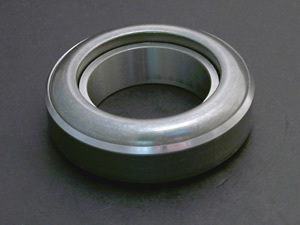 Generally a sealed bearing, these are available in either standard or self aligning styles. Used in dual or single clutch applications where a diaphragm, lever or combined type assembly is used. The operating face of the bearing is flat and designed to operate against a formed tip diaphragm, lever or a lever plate. 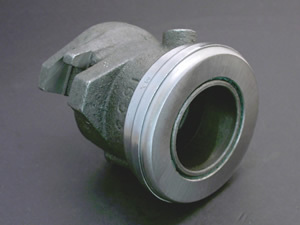 These are generally sealed, although some may have a grease point fitted, also available in either standard or self aligning styles. In dual applications the main and PTO thrust bearings can often be incorporated into a single carrier assembly with one operating inside the other. 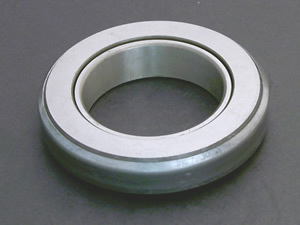 The bearings are press on type which can be replaced if the carrier is serviceable. 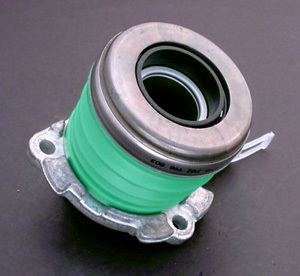 In single applications the bearing can either be a press fit or in some cases, the outer housing is crimped over to retain the bearing, these are not serviceable and must be replaced as a complete assembly. Some older designs may incorporate a carbon insert requiring no lubrication. Most carriers provide grease points for bearing and sleeve lubrication, and some have sealed type maintenance free bearings included. Most assemblies require a bearing "Freeplay" distance to bebet set between the bearing face and contact point of the clutch allowing them to operate correctly. In some applications a special hydraulic mechanism is used allowing the bearing to spin continually, this type requires no adjustment. This combined hydraulic slave cylinder and thrust bearing assembly is designed to operate directly in front onthe clutch cover assembly. The unique design eliminates the needfor complex and sometimes expensive clutch release fork and linkage mechanisms. Having direct hydraulic load applied to the clutch via the master and concentric slave, provides less pedal effort, and over comes the possible loss of bearing travel due to wear, often associated with conventional linkage or cable type systems.